When the streetcar travelled past this block of Yates Street between Broad and Government, it still boasted vintage buildings. Among the businesses housed on the north side of this block were Arthur Holmes – clothing, D. F. Sprinkling – tailor, F. G. Moody – dentist, E. J. Eyres – photographer, International Correspondence Schools, W. Henry Pennock – jeweler, H. P. Winsby – real estate, McFadden and Mould – meat market, S. M. Okell & Co. – manufacturer’s agents, J. and F. Hepworth – tailors, Coast Locators, B. Williams and Co. – clothing, Empire Realty, Diego Zarelli – cigars and shoe shine, the Manitoba Bar, Drake and Horn – hardware, and the Turfman’s Club. At the corner of Yates and Government was the Imperial Bank Chambers with Aikman and Courtney – barristers, Albert C. West – dentist, and Moresby and O’Reilly – barristers above the main banking floor. The scene is quite different in 2009. At the corner of Yates and Broad is the Legacy Art Gallery and Cafe housed in the former Bank of Toronto (William Frederick K. Gardiner, Architect,1950). The corporate heraldic shield is sculpted in low relief above the entrance and remains as a visual key to the building’s history. Further on, new buildings have been built next to old ones, housing clothing outlets, interior design firms, and an architectural office. At the end of the block, at the corner of Yates and Government, is a complete remodeling of the 1883 Pritchard House of which all visible traces have been removed. 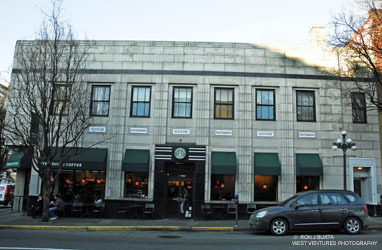 Built for the Imperial Bank of Commerce in 1946 by D C Frame and Douglas James, Associated Architects, it is now the home of Starbuck’s coffee.